The major section of the Green Room charts assembled un the QUALITY title measure not only the effectiveness of the Supply Chain performance but also measures the performance of the personnel in that department. There are 4 charts used in the QUALITY title. External Customer Concerns, Internal Customer Concerns, Defects Received, Defects Produced. As is seen, every item on these 4 sets of charts will generate input from the people attending the Green Room meeting. E.g. in the charts above – see below as well, if a department receives a defect from a supplier which they need for their work, they will be able to participate in the discussions that may take place to rectify the situation. 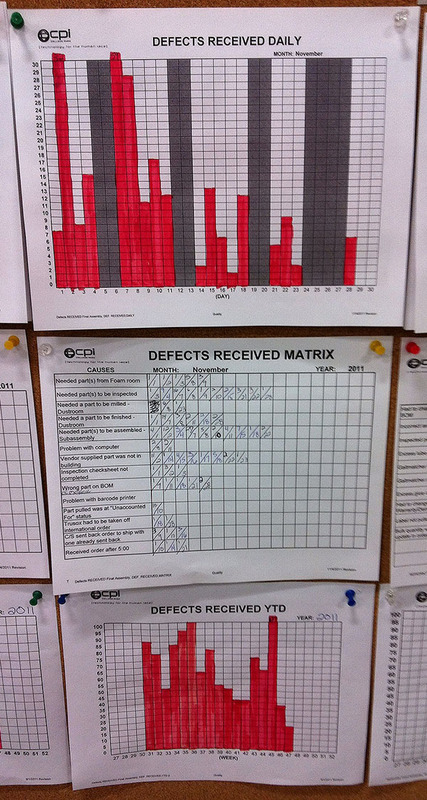 Above is an example of one of the Quality Charts – Defects Received. This is part of a group of four Quality charts the others being Internal and External Customer Concerns and Defects Produced. These charts, apart from the Defects Produced chart, measure the performance of the individual departments or areas but more importantly, reject the performance of the Supply Chain within a company. The above charts – always in 3’s, viz. the Raw Data chart (Daily) which records daily issues, the Matrix chart – centre – which records the actual issue/s and the days on which these occurred and the Year To Data (YTD) chart which summarises each weeks’ issues. Every line entry on the middle chart above represents an explanation of every red block shown on the daily chart. 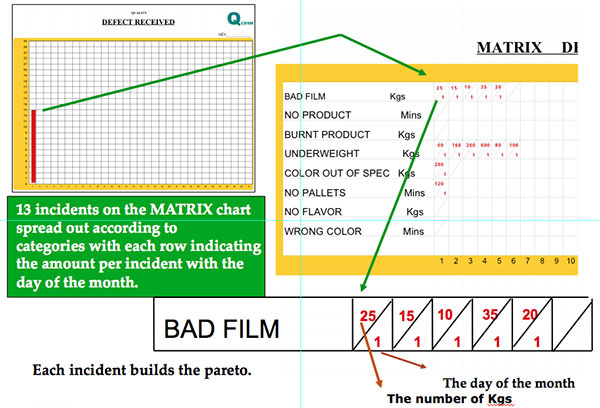 If it occurs more than once on a day, every incident is represented by a separate block on both the daily and matrix charts. A Defect Received measures how many times the supplier/s to a department or area does not get what it is supposed to get including arrival times etc. This enables the team to understand their performance that day or week if their supplier/s do not give them what they need, when they need it and as it was agreed to. The above example clearly shows the performance for that month. The centre chart describes not only each issue but the number of times according to days that the issues occurred. Two other charts – Internal Customer Concerns and External Customer Concerns are in the same format with this big difference – these two charts represent issues that this department r area is having with its customer. Internal refers to what they deliver internally to the next process in line and External refers to any external customer to their facility that has an issue with what this department or area should’ve delivered to them. The most important aspect of this set of charts is the information that each department or area receives concerning their performance. A further explanation of how the Daily and Matrix charts work together is shown below. Below is an example showing how it works. The main purpose of the Green Room meeting is to show in a visible form the performance of a department or area by not only identifying problems but also showing where the department or area performed well (Green blocks) During their meetings they discuss the information on the charts which information assists the participants to address the issues. When they see a Green block this is an encouragement because it shows where the team performed correctly. Many problems and situations are identified through the four sets of charts in the Quality section. The QCDSM process sets up a database in either Excel or Access to record these concerns and to follow up on them each day, either in the Green Room itself, or at the next level meetings , or as a separate ‘response’ group made up of key personnel who can assist with the resolution of the situations. The database becomes the key method for the company to identify issues that need to be addressed in order to maintain consistency. Linked with the Idea/Suggestion process and database, it is a most powerful tool to keep abreast and up to date on what is actually preventing Consistent Quality, Competitive Cost, On Time Delivery, Safety and high Employee Morale. These two databases form the kernel of QCDSM. QCD Systems has many years of experience in training customers on how to set up and manage these databases. We have been told by our customers that this process, followed on a daily or weekly basis, has helped maintain the momentum of their improvement. Additionally it has encouraged their employees to become involved. It has also solved the problem of little or no follow up or response to Employee Ideas and Suggestions in the Green Rooms which in turn has affected their participation and trust that management is prepared to work with them to solve their issues.